One of those wonderful people is a women named Señora Maiz. She was my high school Spanish teacher, and she was (and undoubtedly still is) one of the most passionate instructors I ever had. She loved her job, her students, and her language. One thing I that stands out in my mind about her is that even though her children attended a rival school in our district, she still fervently cheered for her students at track meets and the like. I still remember a surprising amount of the Spanish she taught me, including several catchy songs. We also had a day each semester where we got to eat lots of delicious Mexican food, including delights like homemade enchiladas and fresh sopapillas. This batch of cupcakes, with its popular combination of cayenne pepper, cinnamon, and cocoa powder, is dedicated to Señora Maiz. Preheat oven to 350 degrees F. Line standard muffin tins with paper liners; set aside. Sift together cocoa powder, flour, sugar, baking soda, baking powder, salt, cinnamon, and cayenne pepper into a large bowl. Add eggs, warm water, buttermilk, oil, and vanilla, and mix until smooth, about 3 minutes. Scrape down the sides and bottom of bowl to assure batter is well mixed. Divide batter evenly among prepared cups, filling each 2/3 full. Bake until tops spring back when touched, about 20 minutes, rotating pan once if needed. Transfer to a wire rack; let cool completely. To make the frosting, beat the butter with an electric mixer for a few minutes. Add the powdered sugar gradually until the frosting is thick enough to spread easily, then beat in the cayenne pepper. Apply frosting generously to the cooled cupcakes, top each with a sprinkling of cinnamon sugar, and, after giving the components a few minutes to get to know each other, devour. Very tempting! I love those flavors. What a wonderful combination of flavors! And, as I teacher, I can tell you it works both ways, I have students that I will remember forever. Grace you know that buttercream is something I can totally dig! I always hear about everyone's high school language classes and they're always so much more interesting and fun than ours were :( I did french, and all we had were crossaints with nutella- that was the most interesting thing we ever did in class! These cupcakes sound amazing! Teachers like parents play a very important role in a child's life. 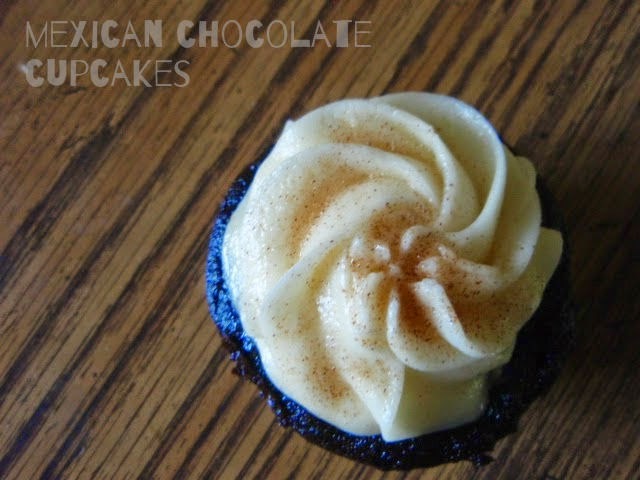 These Mexican cupcakes is the perfect way to cherish your teacher! Such a sweet tribute to one of the teachers who left an impression on you! I love that it's also a bit spicy...because aren't most teachers, when it really comes down to it? What a lovely tribute to your teacher! A lovely tribute to your passionate Spanish teacher. The cupcake looks fantastic, Grace. What a refreshing post:) I had a handful of teachers that I will always remember and often think about them. It seems your teacher made a positive lasting impression. I'm sure she would enjoy these cupcakes as much as I would love to have one right now! I love the addition of cayenne pepper,Grace!What a delicious treat! We all have teachers we remember...even at my great age. My first grade teacher (who also taught my father!) was a gem and then there was one I was NOT so fond of. Hah. Loved nearly all my high school teachers. Have a great Fourth, Grace! These look amazing and delicious! I wish I could taste these! I know my husband wouldn't share in my appreciation of this flavor, so until we have company that I can share them with.... I will just have to enjoy your photo! I have a few teachers that made such a big difference in my life too. The cupcakes would make your teacher proud! They look and sound tasty.